So you’ve made the perfect homemade loaf of bread with your bread maker. Risen to perfection and crust colour under control. Now, you’re eager to dive straight in and taste your freshly made bread. Let me tell you, when that perfectly formed loaf of bread needs to be distributed evenly and fairly between 3 hungry boys, every slice counts. Actually, every crumb counts, but that’s another story. When we cut up our bread we either use a very high quality serrated bread knife, or our electric knife. Important: You should always allow your bread a little cooling and airing time before attempting to slice it. Recently, I have been thinking more about investing in a bread loaf slicer or a electric food slicer. We make fresh bread every day so it sure would get some use for the cost. We’d probably get more slices from each loaf and reduce the more doorstep ‘brick sized’ slices we inevitably produce. On our quest for the perfectly sliced loaf of bread I’ve done a bit of research. What I’ve discovered is that everyone has a personal preference. What follows are my findings on each style of cutting with each kind of bread slicer. It is important not to skimp on quality here, even if it means paying a little extra. Cutting with a bread knife is straight forward and requires no faffing around with plugging things in. This 23cm bread knife is lightweight with soft grip handles and large finger stops, catering for all size hands. A comfortable knife to use for bread slicing is really important, especially for the tougher crusted breads. Kitchen Devils are affordable and trustworthy knives if you fancy a bread slicer that cuts the traditional way. 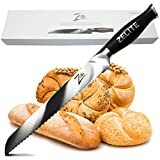 This knife has been specially designed to be able to easily slice through tough crusts and still be gentle when cutting through the soft bread inside. 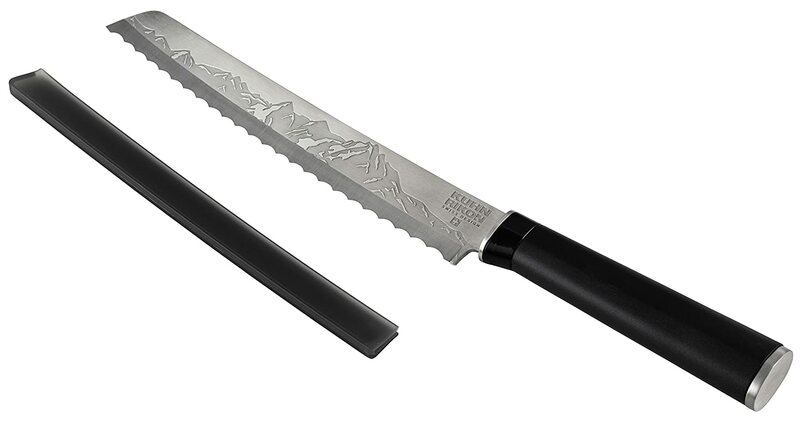 It’s made from Japanese steel and the ultra sharp special serrated blade means that it makes quick work of crusts. 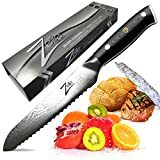 The Swiss designed knife has a ergonomic handle and is covered in a special non stick coating which is protected when not in use by a sheath that is provided which also protects the blade and keeps it sharper for longer. The actual blade length is about 33.5cm which should be more than adequate for your bread slicing needs. The knife is dishwasher safe, but they do suggest that hand washing is kinder to the non stick coating which will make it last longer. The knife comes with a sheath to enable you to transport it safely if you wish to take it out on picnics or elsewhere. Available with a 2 year guarantee. This is a popular traditional 20cm bread knife. It is dishwasher safe and comes with a 25 year guaranteeing the Stainless Steel blade. The blade is sharp and precise but the length might mean that it struggles a little bit slicing through the larger loaves of bread. However, it does have the added advantage of coming in at a very reasonable affordable price. I must admit I never even knew these existed until I started researching bread slicers. Again, as with the traditional knife, these don’t require electricity so always a bonus. The beauty of using one of these is how perfectly straight and even you can get your slices. They do look quite cool and judging by the reviews I’m tempted. I have chosen a few bread slicers in this category with various prices from cheap to expensive. Lakeland have produced this EvenSlice bread slicer to make uneven slices a thing of the past. The simple guide enables you to cut slices in 7 different thicknesses. To help to reduce mess there is a integrated crumb catcher built into the unit. It has a non slip base to aid safe slicing. The EvenSlice can accommodate loaves up to a width thickness of 12cm. It can fold for easy storage and is easy to clean. When setup the Lakeland EvenSlice’s dimensions are: 16cm x 26cm x 7.5cm. It sells for a reasonable price. The only niggle with this Lakeland EvenSlice bread slicer is that the base of the cutting platform is made from plastic and so could get cut by the sharp bread knife that are typically used, but this is still a good option to consider. Designed to fit normal sandwich bread sizes of width of 12cm by 15cm height. With it’s clever design it can be folded up for easy storage. Even though the Skater slicer it is not dishwasher proof, it is easy to clean. It isn’t just restricted to slicing bread as it can also be used for slicing cheese and ham too. These are reasonably affordable, please visit Amazon to clarify current prices. It is a little bit small for larger loaves of bread made in a bread machine. It is probably better suited for medium and small loaves or shop bought bread which tends to be smaller. The reviews are good for this product though, it aids slicing through the bread well and is very easy to store away when not in use. 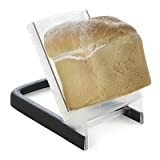 This very stylish bread slicer made with quality in mind from Neat Designs. This has a slicing guide to enable you to easily cut even slices from a loaf using your bread knife. Made from beech wood and brushed stainless steel. Fits all loaves of bread – home made and / or shop bought loaves. The base has been oiled for protection. The stainless steel frame is strong and durable. The frame can easily be detached from the base. 4 clear rubber feet on the base to keep the product in one place when cutting. Can be used by left and right handed people. Although this bread slicer is definitely on the more expensive side it is pure style and quality. I can just see it next to my Panasonic Stainless Steel bread maker! The DB-Tech Compact Foldable Bread Slicer is made from 100% Bamboo wood which is totally natural, pollution free and environmentally friendly. It’s clever spring loaded design enables it to be unfolded and setup within seconds, and then re-folded so that it can be easily stored away. The specially designed grooves enable you to be able to cut 3 slice sizes of 8mm, 10mm and 12mm. However, if you fancy thicker slices then there is nothing from stopping you skipping a few groves to make thicker slices as you desire. You should be able to fit bread up to the width of approximately 15.5cm within the slicer which should accommodate almost all machine baked loaves and most handmade sizes as well. The dimensions of the slicer when setup are (Depth x Width x Height): 30.5 cm x 19 cm x 16.5 cm and when it is folded up it’s dimensions are: 30.5 cm x 19 cm x 4 cm which will really help to enable it to be stored away in a cupboard or shelves when not in use. You should be able to use a electric knife to slice the bread though tough as Bamboo wood is it is still only wood so could be damaged with constant use. I suggest a bread knife with at least a 20cm or longer blade to slice your bread with this. 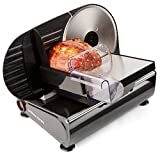 Overall this does seem like a very good slicer for those who want the convenience of a bread slicer, but have limited storage space in the kitchen. Now we’re going to dive into the best electric bread slicers. Do they give you a better cut? Are they easy to use? Quiet running 150-watt powerful motor. On/Off switch and thumb Guard / food press for added safety. Reviewers report that this Andrew James Food Slicer is solid and very easy to clean. Changing the blades between the meat and bread ones is not complicated. Being able to control the thickness of both your bread and your meat slices means that you can really get them to stretch further, especially for larger families. The Swan SP10060 has a 17cm hygienic stainless steel blade that can be adjusted to produce slices anywhere between 1 and 15mm thick. The blade is powered by a 150W motor which requires 2 buttons to be pressed to get the blade spinning as a safety measure against accidental operation. It is also able to slice meats, but there is a question mark over how easy it is to clean this unit after use as it doesn’t dismantle fully to aid cleaning. This will slice an average loaf of bread, but might struggle with some of the larger loaves or long loaves over 20cm in length. 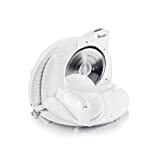 The advantage that this has over a lot of other electric slicers though is that it is foldable which would aid the storage of the unit (approximate folded size 29 x 23 x 15cm). We originally bought an electric knife to cut our Sunday roast, but it is used much more these days for slicing our freshly made bread. It is really easy to use, as long as you make sure that you have allowed the bread to cool slightly, and it is very easy to clean. You do of course have to be slightly more aware when you have kids around when using this, I always make sure they are way back and not tempted to sneak in to pinch a slice of tempting raisin bread while I’m mid slice. This is a very popular and versatile electric carving knife. Which bread slicer you decide to go for will depend on both your needs and your budget. You can quite happily get away with just using a traditional and uncomplicated bread knife . If you want to make your slices a bit more uniform and perhaps thinner then it is worth investing in either an electric bread slicer or electric bread knife .